This past October, tutors, students, staff and board of the Volunteer English Program gathered at the Harvest Celebration to recognize the hard work and dedication of our tutors and students. 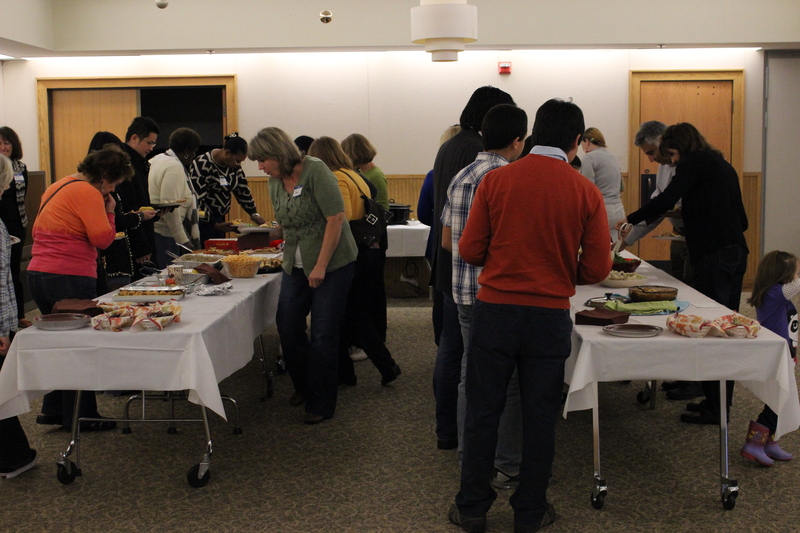 While the event was an acknowledgment of the dedication of these tutor/student pairs and a forum to recognize some special accomplishments, it was also a smorgasbord of delicious foods from around the world. Each guest brought a traditional dish from his or her native country to share. Foods from many countries around the world made for a delicious lunch. (To see more photographs, please visit our Facebook page!) As we enjoyed this global buffet, Executive Director Linda Grosse shared the accomplishments of so many individuals with the group, including recognition from State Senator Andrew Dinniman. Our newest citizens, Jihong Korbonits, Ramez Madanat, Josefa Cordero, and Urmi Patel. A very special thanks and best-wishes were extended to Linda Grosse, who is retiring from VEP after 12 years as Executive Director. Board member Paul Keogan honored Linda, presented citations from State Senator Dinniman and County Commissioner Kathy Cozzone, and spoke of Linda’s undying dedication and tending of VEP to grow it to its current scope and size. After the recognition segment, this year’s student speaker, Xiaopeng “Jessica” Ji, spoke to the group about her personal journey with her tutor, Kate Varley. Jessica’s impressive account of her challenges and experiences learning English with VEP, just one example of the many VEP success stories, was filled with humor, insight, frustration, but ultimately: accomplishment! I want to express my sincere gratitude for giving me the opportunity to enroll in your program. VEP not only made great efforts to improve my language skills but to make better my life in U.S.
First, I want to thank you for my tutor. I know how difficult is to get a tutor for each student on your long waiting list. I was lucky to get the best tutor for me: Connie Partridge. 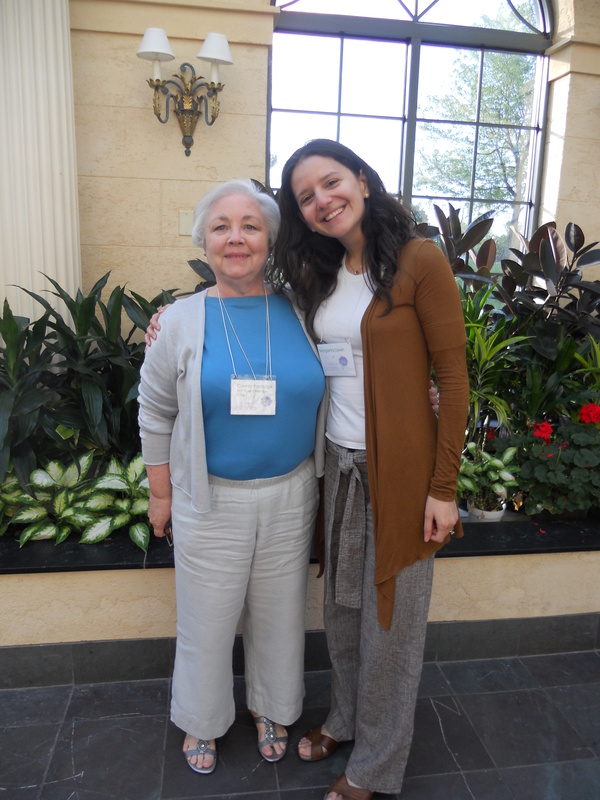 Connie has been my English teacher, my advisor, my coacher, my friend and eventually a mother. Teaching the language in context with the culture makes a significant difference for non-native speakers. This is exactly what VEP tutors’ make. For this reason, the learning process with a tutor becomes more effective than a traditional classroom set. For example, the classes and evaluations took place in real life situations like getting the driver license, having phone conversations, leaving voice messages, writing a claim. As I got the feedback from my performance in all these real life situations, I gained confident to face daily issues by myself. Second, I want to thank you for sponsoring books, audios and online material to study. What I liked about VEP books is that I answered the frequent questions that immigrants have when we first move to U.S. Topics like how to apply for jobs and how to write a cover letter were fun to study and useful to work on my goals. Third, I want to thank you for setting a conversation group. It is good to have this monthly meeting to share with others who are going through the same experience. I got useful advices from advanced students to improve my listening. Also, I met my dear friend Jessica. Since we don’t have the same native language, it was a good opportunity to meet her and get a conversation partner in English. Finally, I would like to express my admiration to this program. The administrative staff was very supportive from the first time I met them. I appreciate all your efforts to run this program. I understand now why America has been a world leader country. People and programs like VEP make that leadership possible. I wish this program could open new chapters around states someday. I thank you again for all the wonderful work you have done and wish you all the best for the future. My student indicated an interest in buying a car. When I asked if there was a problem with her current car, it became obvious she did not have the confidence to speak clearly enough or have enough mechanical knowledge when talking to a mechanic. She also wanted someone she could trust. I felt a skit would be a good way to help her so we played it out and then I asked her to explain which mechanic was better and why. She loved it! Hello. I am Mary and I’m having a problem with my car. Hi, Mary. I’m Butch. What’s your problem? Well, a couple of things: when I put on my brakes I hear a loud screech and my steering wheel shakes. OK. We’ll put your car up on the lift and check your brakes. What else? Well, this is a pain! Almost every time I stop at a red light or stop sign, the engine dies. So, when you turn the key – you know…start the car – does it start up right away? Tell me this: when you slow down just before stopping, does it idle smoothly or shake a little? Oh, gosh. I don’t remember that. I have to admit, I really don’t know anything about cars – you know I get in, turn the key on, turn the radio on and just go. Oh, yeah… seatbelt, of course (ha ha)! That’s ok, Mary. That’s what we do – most people aren’t much better than you. When can you leave the car? This may take 2 – 3 hours depending upon what we find. I need my car by 12:30 every day, so any morning would work. Good. We are really busy this week. How about next Wednesday? Can you have it here by 8:00 AM or the night before? Yes. Maybe the night before at 5 – 6 PM. Good. Let’s get your name and contact information… phone on the Wednesday morning schedule. Wait. How much is this going to cost me? As you might appreciate, until we get in there I can’t give you an accurate quote. The brakes could go from $200 to $400. The engine stall could be simple or take more parts and labor. How about when we check things out I’ll give you a call Wednesday morning with a pretty close quote. I would suggest the brake is more critical. You can decide then. By the way, my dad started this business. I’ve been here since I was a kid. That’s good. How do I pay you? Credit card, debit or cash. No personal checks. OK? OK. I’ll talk with you Wednesday and I’ll drop the car off Tuesday evening. Hello, I’m Mary and I’m having a problem with my car. Well, you came here. What’s your problem? OK. Sounds like you need new brakes and brake rotors. The engine may need a tune up including new plugs. First thing I see – you need at least 2 new tires up front. They’re dangerous. Who knows what we’ll find with the stalling deal. When can you drop off the car? Any morning, but I’ll need it back by 12:30. Well, that’s hard to guarantee. How do I know your bill? Can I get an estimate? That’s touchy, but you know once we take everything apart, there will be a labor fee, but you can’t drive with bad brakes. May it will be $400 to $500 for that alone. Tomorrow then. We are not too busy right now. Don’t you want my name and phone number? Oh, yeah. Good idea. By the way… cash only. How long have you had this garage here? I don’t remember seeing you. Been here for months. I’ve been a great mechanic for years. Tomorrow then… leave it now?? I’ll have to check my schedule. I’ll call you when I’m ready. Can you give me your name and phone number? Thanks for your time.